Eden House in the Fort of Galle is as flamboyant and full of joie de vivre as its owners. The house is a celebration – an eclectic stage set – of travel and experience that is only possible in the tropics. 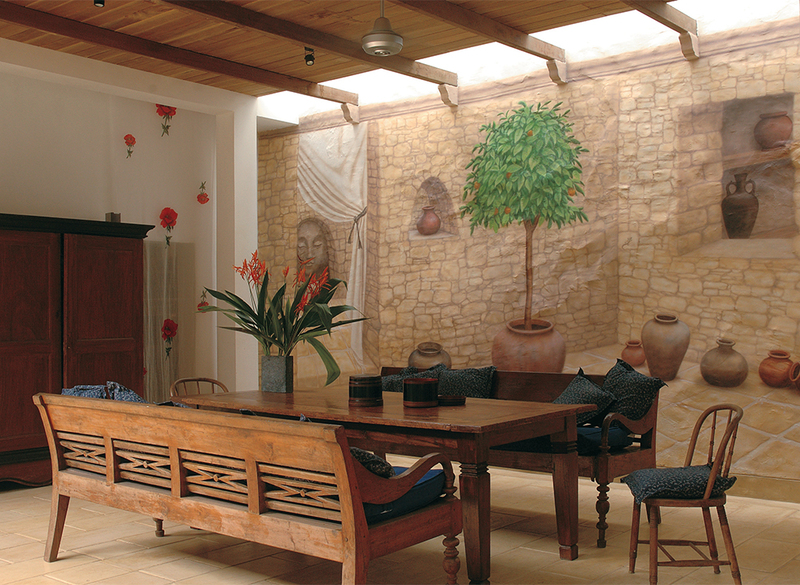 The house, located in the original market square of Galle, is entered through a small courtyard off the street. 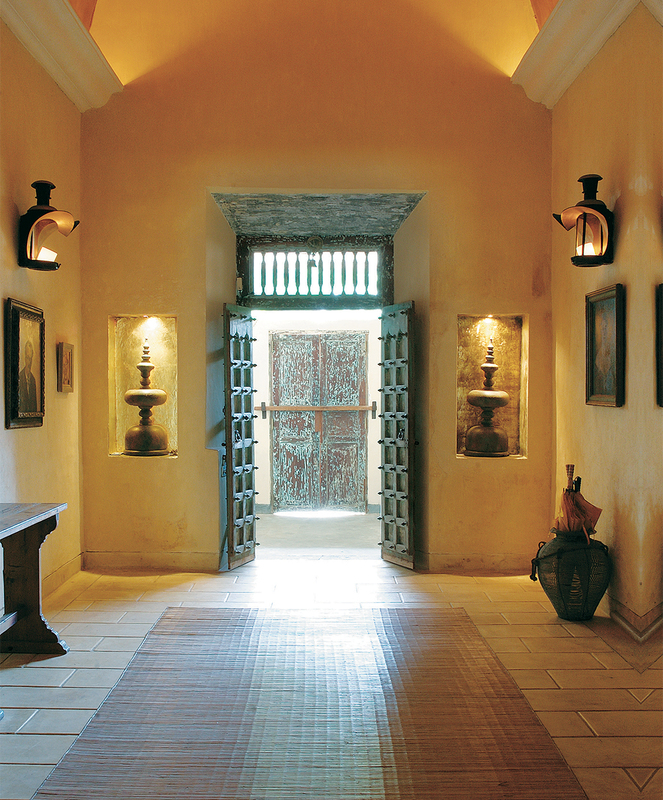 A simple veranda leads to the dramatic entrance hall, reminiscent of some great Moroccan Kasbah. The vaulted ceiling is softly and mysteriously lit from a cornice above. In the main body of the old house is a kitchen that swerves out into a dining room in one of the wings. This space, too, evokes the mysteries and romance of the Mediterranean through a trompe l’oeil of a stone-lined courtyard complete with a Spanish orange tree! A sitting room occupies the other part of the old house. At the back of the house the two wings flanking the space are a fantastic evocation of a Moroccan courtyard. Plain plaster columns are brought to life by trellised arches that glow at night from concealed lighting. An ornate wrought-iron balustrade, protruding half-round roof tiles and brick paving laid in a herringbone pattern add to the flamboyant ambience. An ancient mango tree and a coconut palm add a green twist. Pale flagstone flooring under the colonnades and muted walls make the space appear much bigger than it actually is. The upper level of one wing is a flat-roof terrace on which an industrial chimney camouflages a water tower. The rooms on the upper floor of the other wing are reached by a circular staircase and a long veranda. 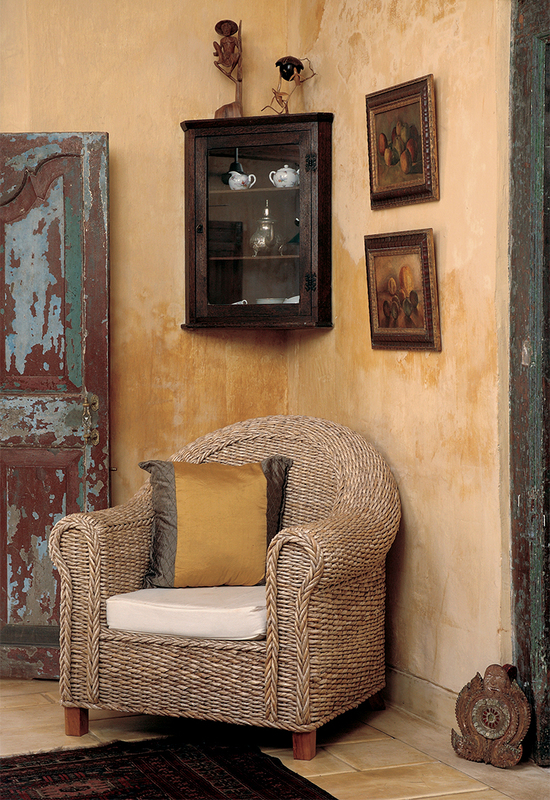 The house is filled with a variety of furniture and artifacts gathered from various experiences and existences that the owners have had: China, Morocco, the United Kingdom, India and Indonesia are all represented. Objects and colours are thrown together with gay abandon but come together in an amusing and pleasing way, contributing to a style of decoration that is as eclectic as any to be seen. This article was published in the August 2016 issue of Inspire Living Magazine. Download it here!